If you don't mind, I'm wanting to put together a little pamphlet to distribute around town. Nothing quite like a shocking picture to grab attention! The message IS getting out. I am hearing rumblings even here in the middle of nowhere. We simply can not allow our country to be taken from us. We can not allow our rights to be taken from us. That is BS! What happened to our right to a peaceful assembly? That is it! Our Government fears a war with the illegals! Why push for amnesty for millions of them when they KNOW it will hurt Americans? He needs to make this public and sue. Remember money is what makes this country go tick. Looks like violence is what they are recommending...that is the police since they bowed down to it. Kele, I sent you a pm. I've got some folks that will really want to see these pics! I'm sending out photos right and left. If anyone else wants them, PM me. Police afraid of pro-illegal mob threatening violence, so anti-illegal demonstrators were made to leave. 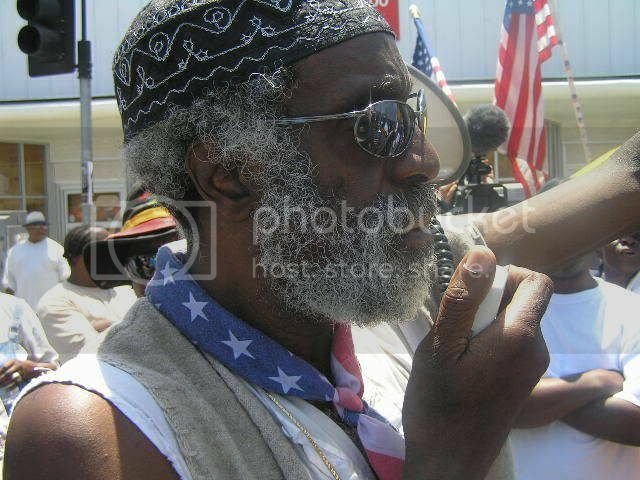 News Report: "Activist Ted hayes organized a march and demonstration and had a permit to march down Crenshaw Blvd. to Leimart Park, the rally was for homeless rights and anti-illegal. His group met with an angry pro illegal group, 250 to 300 community members, who took issue with Ted Hayes group being in the community, so they blocked access to the park. It was made very clear by police to Ted Hayes and Minutemen that those who didn't want to leave would be arrested. Ted Hayes said "I went to the trouble to get permit to have this park right here so we can express our 1st amendment rights to talk about how our civil rights are being hijacked by citizens of a foreign country who are here illegally. Mr Hayes and 4 others were arrested. 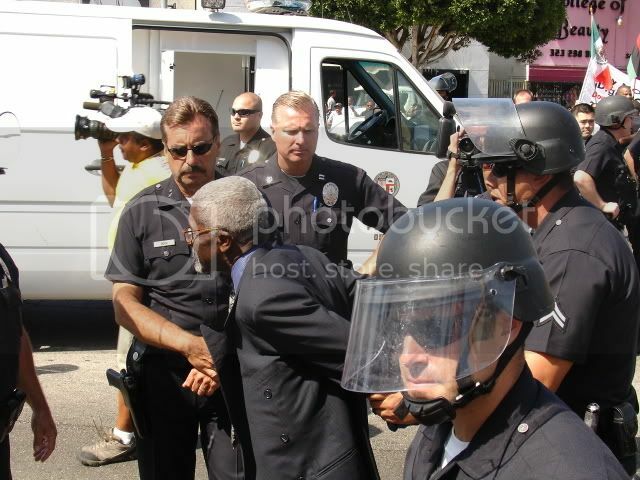 L.A. PD said it was his choice to be arrested." You realize many of these so called 'community members' in this report were illegals. Ted Hayes and Americans there are legal citizens have been in L.A. community 'lightyears' before these criminal illegals showed up. 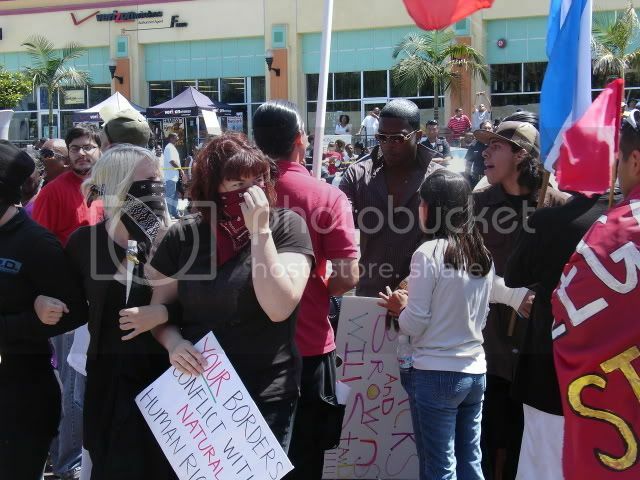 Kele has two posts on this on the "Mexifornia thread" page 7 or 8, with photos and pro-illegal flier full of lies. That is horrific! 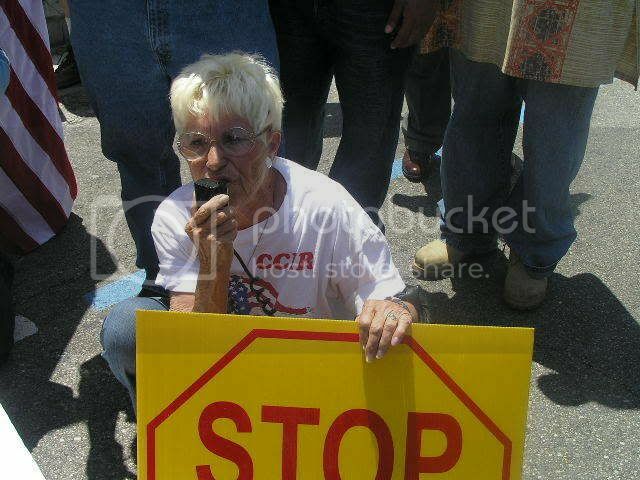 Where is the "American" Civil Liberties Union to fight for Ted Hayes' rights to speak??? That's right... the ACLU is too busy fighting for the lives of murderors on death row, of terrorists who get picked up overseas, and of anti-Christian folks across America. They have no time to fight for the free speech of Ted Hayes. Explanations of the photos are above each photo. "There are only three colors in America...Red, White, and Blue, and these colors don't RUN!!!" 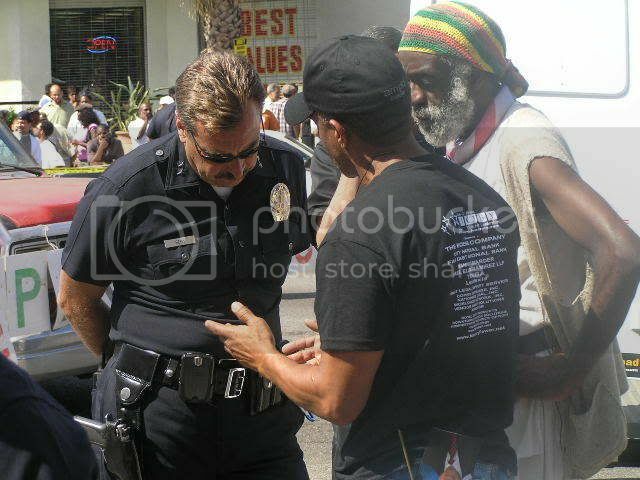 Negotiating for our permitted right to Free Assembly and Freedom of Speech in Leimert Park. A picture is worth a thousand words. 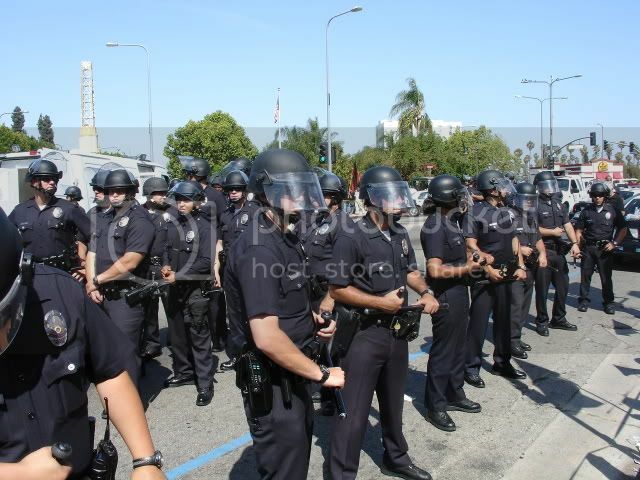 Riot police "protect" violent protesters from outnumbered law abiding Americans. 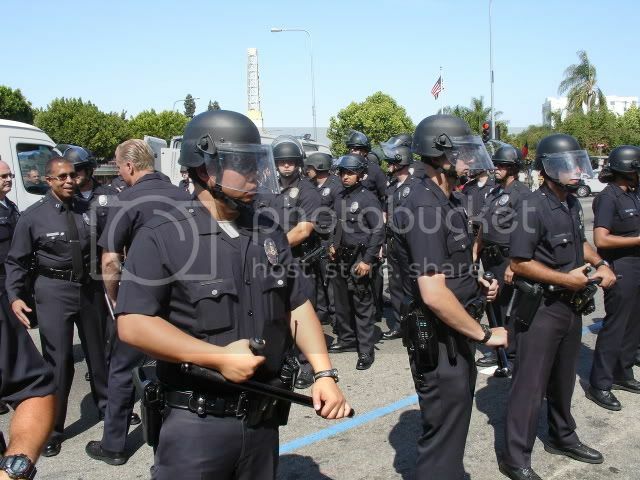 The "children" in Leimert Park the L.A.P.D. were afraid would get hurt. What you can't see is the big ol' Mexican flag on the front of their table. 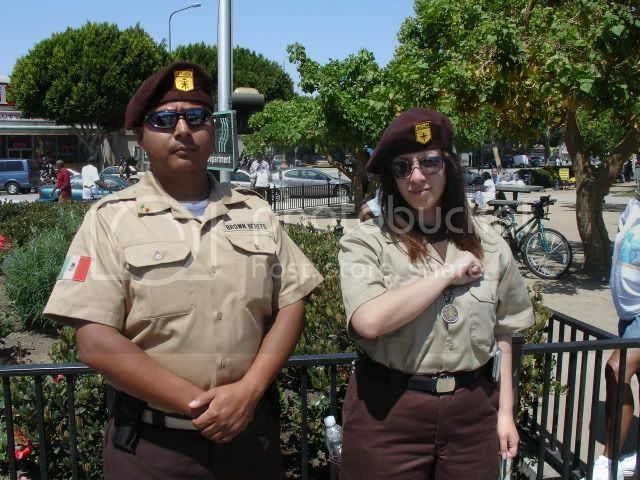 For those of you who are not fluent in your knowledge of radical organizations, these people are members of the "Brown Beret." 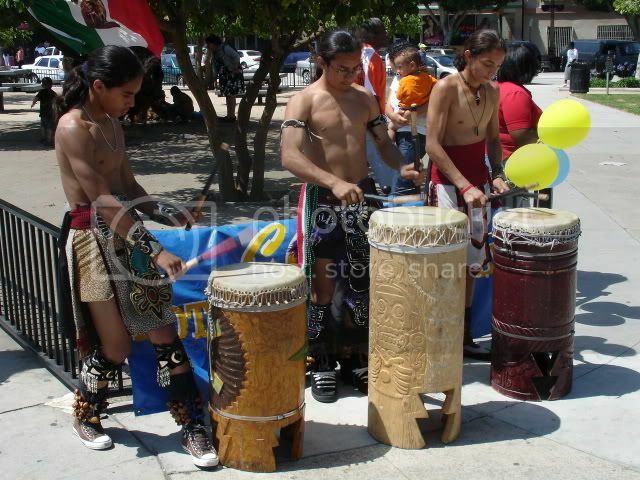 More of Leimert Park's "children." Speaks for itself or at least it should. 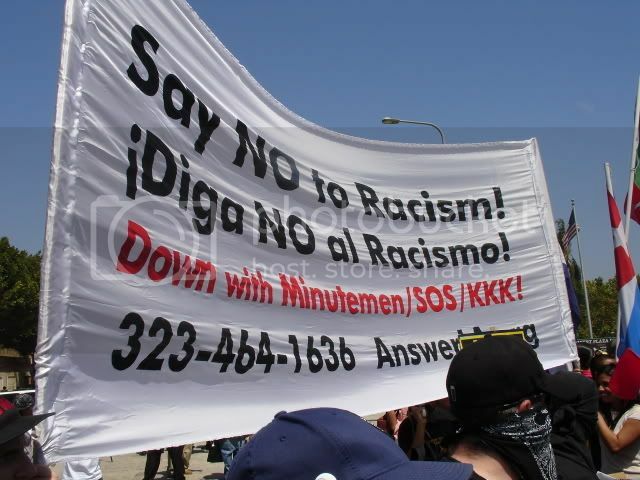 AnswerLA is a radical left Socialist organization which shows up at every protest so that they can manipulate their illegal alien lapdogs. Notice the bandanas. They rarely show their faces. Now why do you figure that is? Hey America! Do you get it yet? A "dangerous" American patriot is arrested for having the courage to stand up and say NO to mob rule and anarchy in Los Angeles. Last edited by Kele; 06-27-2007 at 03:29 PM..
Lovely, don't you think? 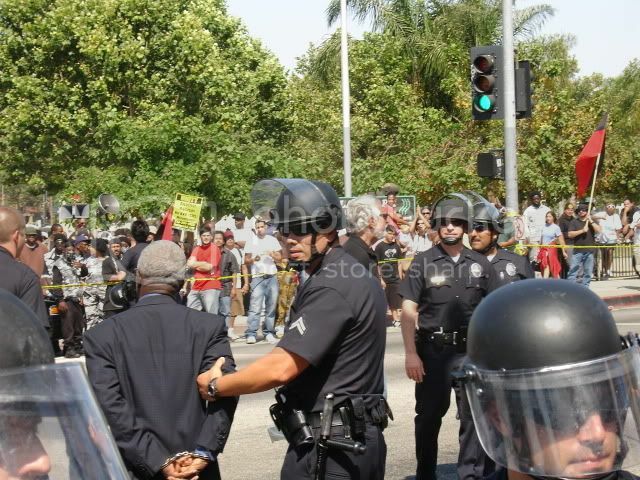 Notice how many of the rank and file are facing the American line and the lack thereof in front of the opposition, the ones who threatened violence if we were allowed to have our permitted rally in Leimert Park. So how many were in your group, how many were in theirs and how many cops were there? It looks like cops outnumbered you two to one! There were, before we were boxed into a corner, about 100-150 of us, about 300 or so on the goonage side. 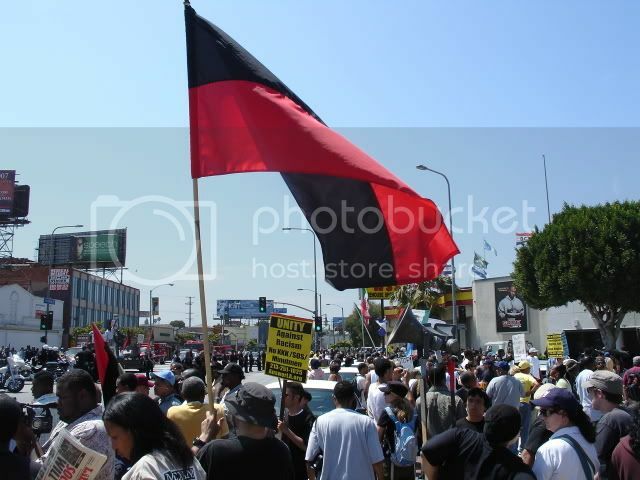 Many of our group had decided to wait at Leimert Park for the rally rather than march and so when we were prevented from entering the park, many of our own were cut off from our group and forced to remain behind enemy lines. 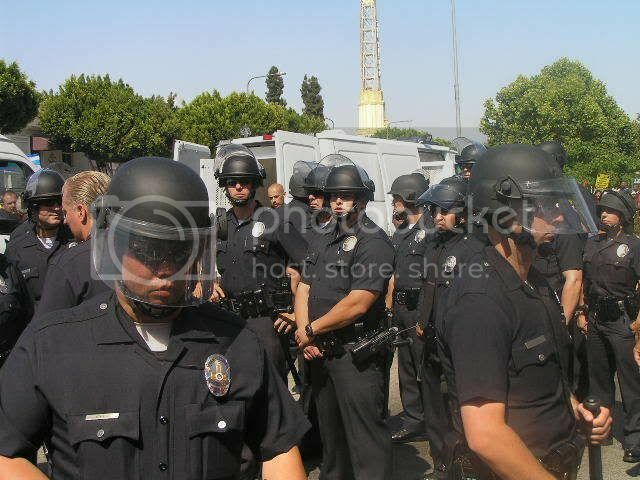 There were over 100 police and from what I've heard through the law enforcement grapevine (we do "know" a few) the entire city of L.A. was on tactical alert because the goonage flat out told the police that if we were allowed to assemble in Leimert Park, which we had a permit to do, they would respond with violence. So I guess they were arresting us for our own good while "bending over" for the goons and their mob rule. I really don't blame the rank and file cops, I know that they were just following orders from Mayor Reconquista and his pet squid, Billy Boy Bratton, to shut us down no matter what. Last edited by Kele; 06-27-2007 at 10:17 PM..
Stop the problem at the source -- our border. If the leadership of country did that, these extremist illegals would not be here today. It's not too late. We still can protect our border. Those who are fighting this invasion, thank you. I just watched on video in which traitor Bush said that we have released criminal illegals who are murderers, rapists, etc. because their country wouldn't take them back. It makes my blood boil because if we just enforced border security, none of these criminal illegals would be here today and none of these extremist illegals would be here today.